The Wizard of Oz is a wonderful tale of love, fantasy, action and courage, and it will always be in the hearts of the people who watch it. The story was based on the very popular children’s book, The Wizard of Oz. This film’s genre is a musical and fantasy/ adventure film that was created in 1933. This movie was directed by Victor Fleming, and the movie stars many wonderful actors and actresses including: Judy Garland, Karl Slover, Frank Morgan, Ray Bolger, Jack Haley, Margaret Hamilton, Billie Burke, Pat Walshe, Clara Grapewin and starring as Toto is Terry the dog. The story of the Wizard of Oz brings its viewers into a charming farmhouse in Kansas where a young girl, who goes by the name of Dorothy Gale, lives. Dorothy lives with both her uncle and aunt, Henry and Em, and she lives with three farm hands called Zeke, hunk and Hickory. One day, Dorothy’s rambunctious pup, Toto, bites a woman called Miss Almira Gilch. She became outraged with anger and so she called the police, so they can secure the dog and put it to sleep. The officers take Toto away; Dorothy stays behind worried for her dog. But, Toto miraculously escapes the people who were going to put him to sleep and returns home. Dorothy becomes very happy to see Toto, but she feels her dog is not safe so she runs away with him. While she was running away, Dorothy goes to speak with a physic that lies to her about her aunt’s health in an effort to get Dorothy back home. When she makes her way back to Kansas, Dorothy gets caught in a massive tornado that takes her to a magical fantasy world, her loyal dog by her side. In this fantasy world, she meets a good with called Glinda A.K.A The Good Witch of the North. Soon after, the Wicked Witch of the East dies because a large house falls and crushes her. Then the many munchkins arrived, singing in happiness, until the Wicked Witch of the West arrives demanding for the red shoes that belonged to her dead sister. Dorothy asks the good witch how she can get back to Kansas, she tells her to ask a wizard. She then tells Dorothy to follow the Yellow Brick Road. Dorothy sets off to find the wizard and go back home, and along the ways she meets a Tin Man, Scarecrow, and Cowardly Lion. All of them have wishes that they want the wizard to fulfill such as to be courageous, get a heart and one wants a brain. Finally, the group sets of to find the wizard and get their wishes fulfilled. 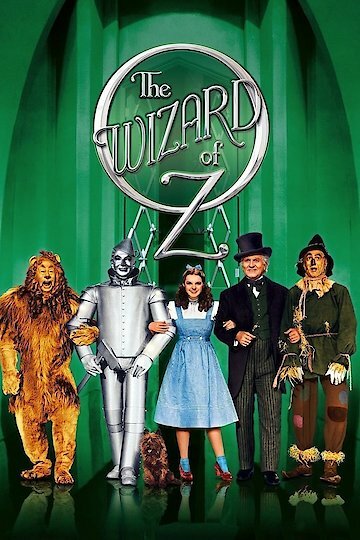 This movie is rated G.
The Wizard of Oz is currently available to watch and stream, buy on demand at Amazon, Vudu, Google Play, FandangoNow, iTunes, YouTube VOD online. Fans of the musical have been waiting over a decade for a movie version, but Universal this week put a specific end date on their waiting period.